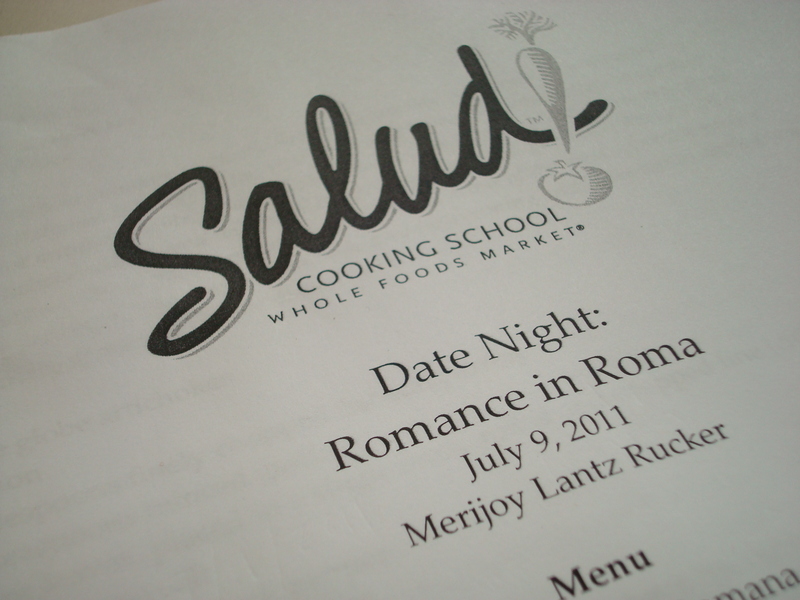 On the evening of July 9, JD and I made our way to Whole Foods where we were participating in the “Date Night: Romance in Roma” cooking class. This is a “hands-on” class, versus a demonstration, and we were excited (and hungry!) to get started. The instructor — Merijoy Lantz Rucker — went over each recipe on the menu, 6 total, and talked about how we would cook each one. Without knowing what was going to happen next, JD and I thought we’d be left to our own devices to cook things that we’d never tried before. We further panicked when she said, “And you know when you normally braise pork…” since neither of us had ever made anything with pork except sausage, hot dogs and your basic tenderloin from the grocery aisle… we were a bit nervous. But then they gave us some aprons, divided us into teams, and with two other couples diving in with us, we were given much more instruction than the original overview. The class turned into more teamwork rather than couple work (my expectation was that JD and I would be romantically cooking up a whole meal together at our own station), but all twelve in the class shared space, utensils and the menu and we all made different items. I was so impressed with JD and how he jumped right in to specific dishes with the other team members. (I think Merijoy liked him best… she teased him a little throughout the evening.) It was definitely satisfying to sit down after everything had been prepared and just relax, eat, and toast our wine glasses. I would recommend the class again, but probably with these things in mind: it will get crazy busy, it’s not as clean-cut as you may expect a class to be, and you may not know anything about the food you’re cooking. (I’m a planner and probably would have preferred at least looking at the recipe for some of the foods before even coming to the class.) Overall, I’m glad we did it and it was a fun way to celebrate our anniversary!